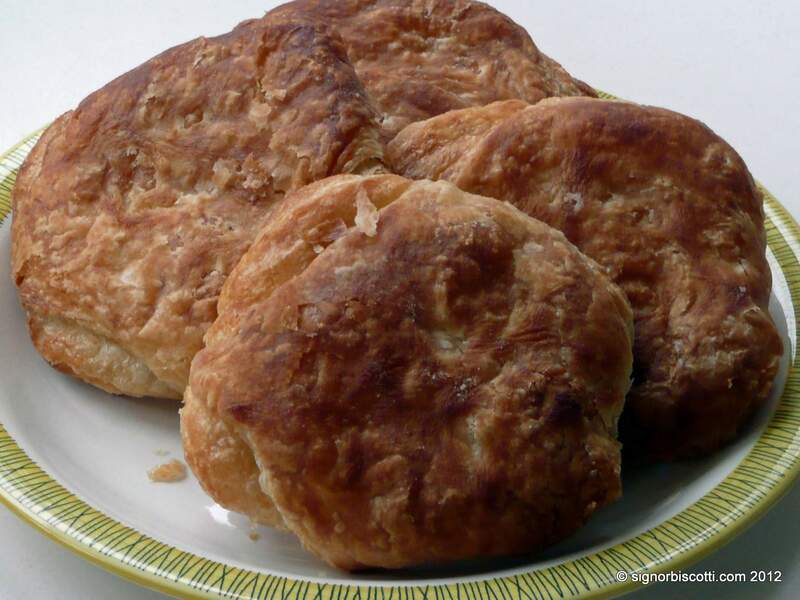 One of my favourite Aberdonian things were these rolls, which we always called Rowies, although their official name is Butteries. Superficially they are like flat, round croissants, but really they are quite different. They have the same flakey exterior, but they have a distinctive flavour and smell, coming from the use of lard as well as butter to make the layers in the dough. They are also quite salty. The ones you buy in the shops contain much more salt than in this recipe, and are perhaps all the more tasty for that, but the high salt and fat content has led at least one celebrity doctor to call for them to be banned. I’d say don’t ban them, just don’t eat too many of them. 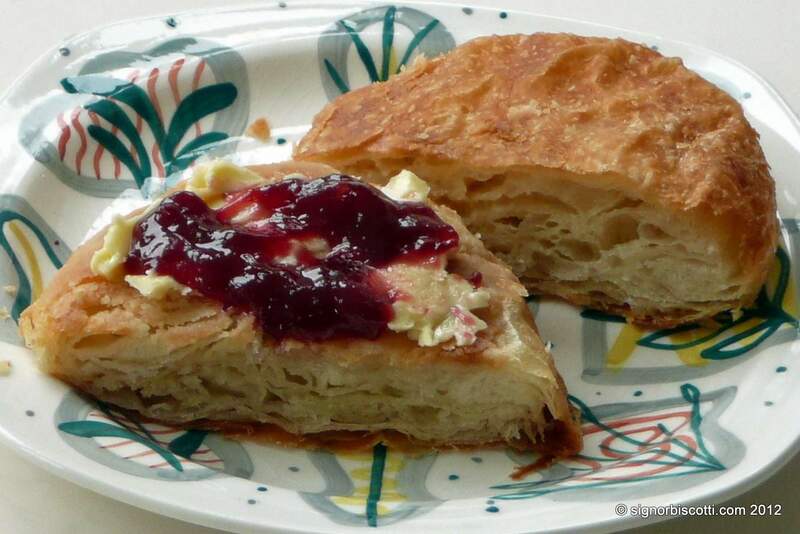 These rolls are delicious cold, or warm, or even toasted and spread with butter (yes, even more butter) and jam. They freeze well, and actually improve with keeping for a few days. To make the dough, mix together the flour, sugar, salt and yeast in a large bowl. Pour in the warm water and mix until combined. Turn out onto an unfloured surface and work or knead briefly, stopping as soon as the dough is smooth. Return to the bowl, cover (with a shower cap or cling film) and leave to rise for about an hour until doubled in size. Meanwhile, mix together the butter, lard (and salt, if using unsalted butter) until they are just soft enough to spread. Turn dough out onto a lightly floured surface, flatten out into a disk, then reform into a ball. Roll it out into a rectangle 20 x 40cm. With the short edge towards you, dot a quarter of the butter over the nearest two thirds of the surface, then spread it out roughly. Fold the unbuttered third down over the middle and then fold the bottom third up over this. 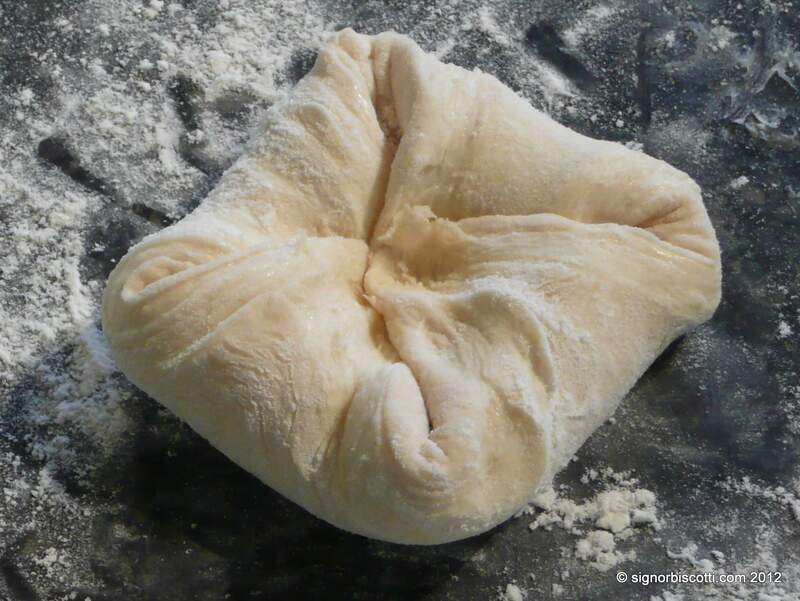 Turn the folded dough so the shortest edge is towards you again, then repeat the rolling and buttering process three more times. As you go you may need to scatter more flour on the work surface and/or the dough. If the butter is getting very soft, and especially if it breaks through the surface of the dough, chill the dough in the fridge for 30 minutes or so. 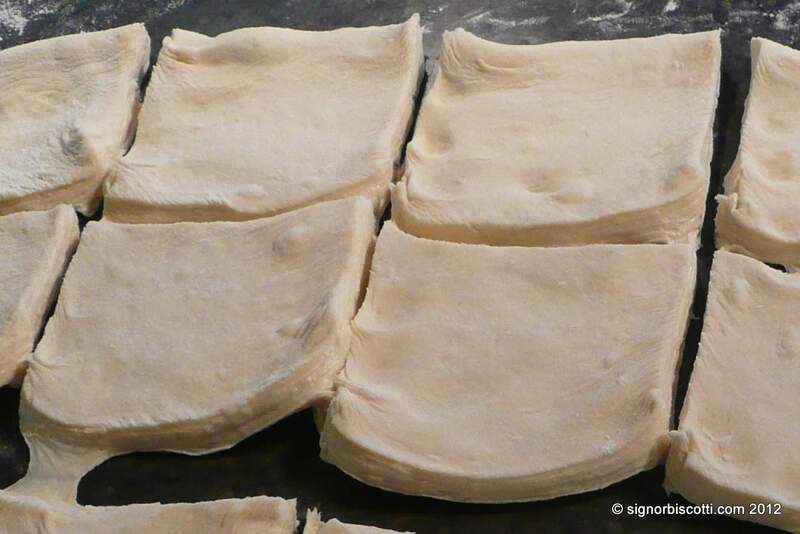 Roll the dough out into a rectangle 30 x 50 cm and divide into 15 10cm squares. Don’t worry if they’re not all exactly the same size. Take each piece and fold the four corners into the centre and press down to seal. 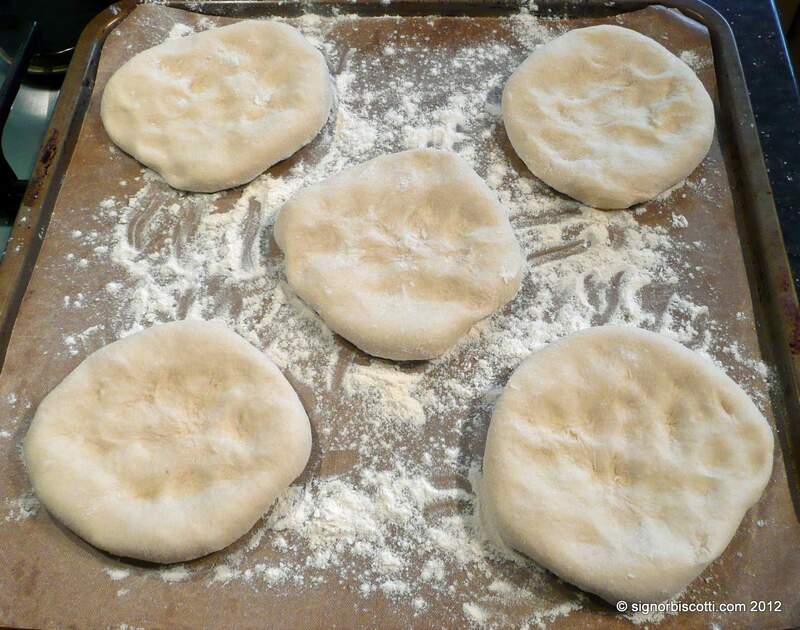 Turn over and shape into a rough circle by tucking the edges under a little, then use your fingertips to prod the dough down and out to make a rough disk about 1cm thick. They should be thin and quite roughly shaped, with a dimpled surface. Place on the well floured baking sheets. Cover with tea towels and leave to rise for about 40 minutes. Meanwhile, preheat the oven to 220C (adjust for fan oven). Bake for about 15 minutes, until a lovely golden brown colour. Check them and turn the trays after 10 minutes. Leave to cool on the trays for 5 minutes or so before transferring to cooling racks. I really like being introduced to new regional baking recipes. Also like the use of lard – and as you say ‘don’t ban them, just don’t eat too many of them’. Yes, let’s thumb our noses at the PC food brigade!